Stewart addresses ABA's Summer Leadership Meeting in Seattle in July 2016. Laurie Stewart’s bank is in the other Washington—Washington state, that is. But her connection to both legislative centers—in the state capital of Olympia, as well as in our nation’s capital—has positioned her as a leader in advocating for the banking industry. 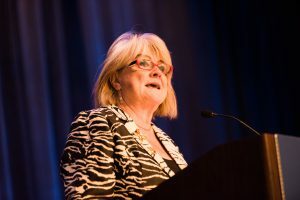 Members of Congress from her home state know the $540 million Sound Community Bank, where she is currently president and CEO, and Stewart knows the potential that name recognition can have on the floor in Washington, D.C.
Stewart addresses ABA’s Summer Leadership Meeting in Seattle in July 2016. Stewart regularly invites up-and-coming employees to legislative lunches in Olympia to talk to lawmakers. And Sound’s executive development program also takes emerging leaders on annual visits to D.C. “Part of the legacy I would like to leave is that other people get as excited about advocacy as I do. And I try to extend that beyond the C-suite,” Stewart says. The legacy she speaks of stretches past handshakes. “We’ve also got to put dollars behind our presence,” she says, “and that’s a big part of advocacy.” Her bank makes a corporate contribution to the 501(c)(4) Fund for Economic Growth and solicits support for BankPac at the management and board level. “It’s no different than the other things that we build into our operating budget,” she says—likening BankPac and Fund contributions to investments in infrastructure, software or training at the bank. 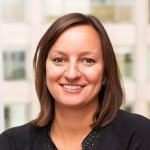 Each year, her board includes an agenda item on BankPac and the Fund and suggest what Stewart calls a “fair-share contribution.” She also anticipates instituting an employee-wide drive in the future and sees the potential to reach a wider pool of contributors as a necessary next step. Stewart’s tireless efforts led Rep. Derek Kilmer (D), whom she refers to as “a rising star,” to visit Sound’s Tacoma branch—one of only a few branches that has an in-house lending and retail unit—last fall. Employees raised topics like fair lending and credit, and Kilmer left with anecdotes and information to help him better understand what regulations mean to the people he represents in D.C.